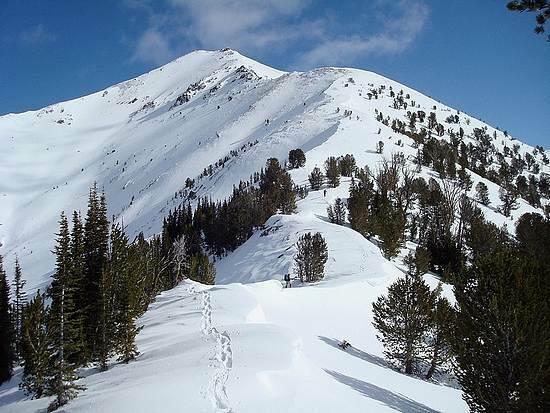 Galena Peak is located in the Boulder Mountains northwest of the Ketchum and Sun Valley area. It stands at the end of a string of towering 11000-foot tall peaks along the Boulder Front next to Highway 75. JohnR, George, and I had been itching for a winter ascent of Galena ever since our trip to Titus Ridge the prior winter. We’d been keeping our eyes on the avalanche reports and weather forecasts for a while, waiting for safe conditions. The time was right for this weekend, and plans were set. We’d invited along a handful of guys to help break trail on the way up. But as “go time” got nearer, our group was getting smaller. Even JohnR had to back out, which was a big bummer. That left three of us (George, Splattski, and me) to tackle the peak. We got an early start on the drive and made it to the Senate Creek trailhead (right next to Galena Lodge) by about 8:30am daylight time. After some brief discussion, it was decided to cross the meadows and climb the southwest ridge of the peak, then descend the west ridge on the way back to make a nice loop hike. Temperatures were single digits down low, but we warmed up in a hurry, as the climb got steeper climbing the tree-covered lower slopes of the peak. Splattski broke trail most of the way, and we made good time, getting above the tree-line in about two and a half hours. The weather was great, and so were the views. We could even make out three skiers nearing the summit on their way up the west ridge. After a snack break just below point 9824’, the climb resumed and we were eyeing some rocky sections not far above us. At the base of the rocks, we switched from snowshoes to crampons to scramble up the rocks. That section was fun, and the views kept getting better and better the higher we got. Soon we were on the final stretch to the summit, but our pace got pretty slow and I felt like I was walking in quicksand because of fatigue and the elevation. Conditions on the summit were excellent. It was a little cold, but only a light wind. We ate lunch, snapped photos, and tried to identify other surrounding peaks for a while until it got too cold. The descent down the west ridge was no problem, and we dropped about a thousand feet with no issues. After a while it looked like we might be able to glissade down into the valley, so we cinched up the gear straps and got ready for the slide. Splattski went first, and George had the most speed. Good times were had by all, and we dropped nearly a thousand feet in a hurry. We switched back to snowshoes for the rest of the way out, following the tree-free avalanche path down the valley to the base of the mountain. We made it back to the trailhead in just under 8 hours after 7+ miles round trip and 3850’ of elevation gain. I was very happy with the day, my first winter ascent of an 11000-foot peak! Overview map of our route. 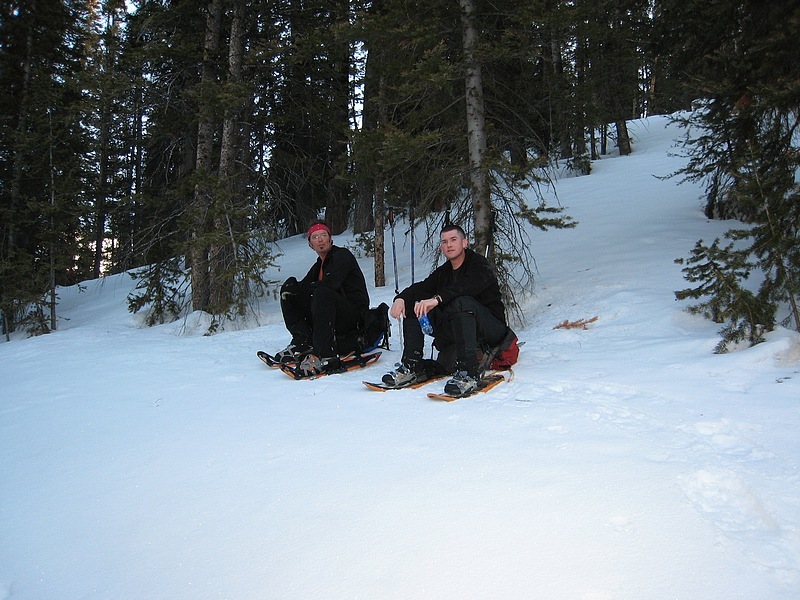 Splattski and Dave taking a rest in the forested section (George R photo). Splattski snowshoeing through the forest, nearing tree-line. One of the first good views of the summit ridge after leaving the trees. George and Splattski at the base of the ridge, from point 9824'. Splattski leading the way, as usual. George and a good view of the Smoky Mountains in the background. Still about 1000 feet to go from here. Looking southeast towards Cerro Ciento and Easley Peak. George nearing the scramble section. Splattski climbing at about 10800'. George bypassing the final rock section. The final stretch to the summit. Notice the ski tracks from some earlier visitors. Castle Peak towering above the White Cloud Mountains to the north. The view southeast from the summit at the big peaks on the Boulder front. Looking across at the crux section of the southwest ridge, from the west ridge during the descent. Snowshoeing down the avalanche gully, scoured free of trees. View of Titus Ridge from Senate Creek. Looking back up at Galena Peak from Senate Meadows, near the trailhead.